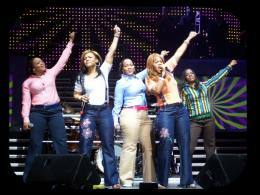 It is intriguing to see how Gospel concert tours have progressed over the years. 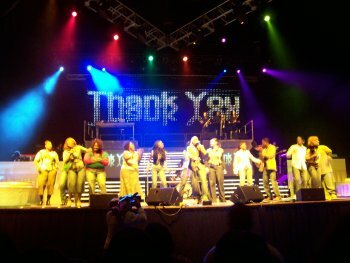 Over the last decade, Gospel has assembled some memorable tours, including the Tour of Life, Power 98, and most recently Hopeville and Hopeville 2. Well, you can add the Hero Tour to that growing list of progressive and groundbreaking tours that will unquestionably change the game. 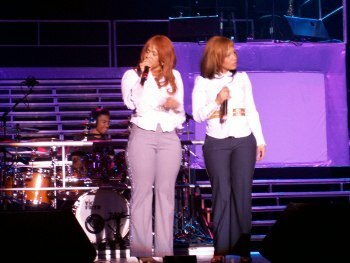 The tour, which features platinum-selling artists Kirk Franklin and Mary Mary (read interview), rolled through the Hampton Coliseum, in Hampton, Virginia on March 18th, 2006, and GOSPELflava.com was definitely in the house. 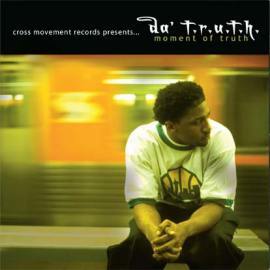 The evening’s festivities kicked off in grand fashion with Cross Movement Records artist Da’ T.R.U.T.H. representing for the holy hip-hop movement. It’s the first time that holy hip-hop has been displayed so prominently on such a high profile tour. With several thousand in attendance, Da T.R.U.T.H. brought the thunder, spitting prolifically as only T.R.U.T.H. can do (read interview). 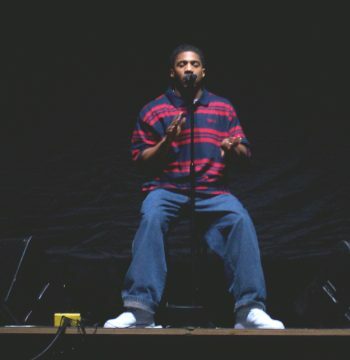 Performing with a simple black curtain as his backdrop, the emcee laced the thousands on hand with tracks such as “My Story”, “On Duty”, “N.F.L. (New Found Love)”, and “Turn You Around”. As Da T.R.U.T.H. left the stage, that unassuming black curtain fell to reveal perhaps the most exciting tour stage setup to date in Gospel music. The set, filled with video walls, special lighting, and risers that served as doors, totally transformed the stage into something that rivaled any mainstream stage or musical award presentation. It was, in a word, bananas!! Kirk Franklin’s all-star background crew entered to sing “Hero”, preparing everyone for the entrance of headliners Kirk Franklin and Mary Mary. 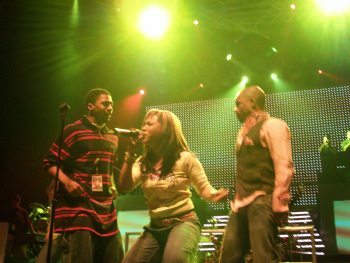 Following a well-crafted video presentation, Franklin, along with Mary Mary hit the stage with their hit “Thank You” from the Franklin-produced Kingdom Come Soundtrack (read review). 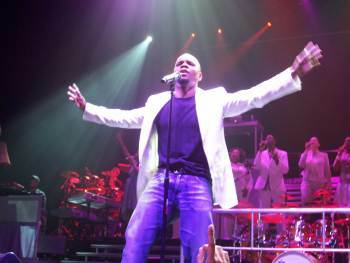 After rocking the audience, Franklin greeted the thousands in attendance and stated his appreciation for the area’s longtime support of his work. He then brought Da T.R.U.T.H. back for an a cappella rendition of “Resurrection”, thereby setting the house ablaze. 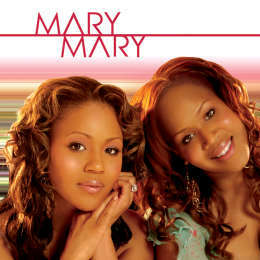 This set the stage for a well-produced video presentation that showed Erica and Tina Campbell, also known as Mary Mary, transported to the biblical days as Mary the mother of Jesus and Mary Magdalene. Suddenly, they awaken in 2006 to find that they both had the same dream and are now compelled to share this message with the world. With that said, the band went into the lead cut, “Believer”, from the duo’s current self-titled project. 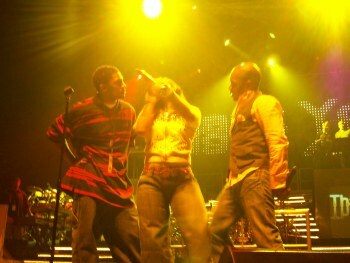 This launched an hour long set that saw the duo revisit bangin’ cuts from their last three projects, including a four-song set of “Believer”, “Joy”, “Ordinary People” and “In the Morning”. Just a few minutes into their run and you quickly realize the depth of the catalogue that this award-winning duo could pull from. 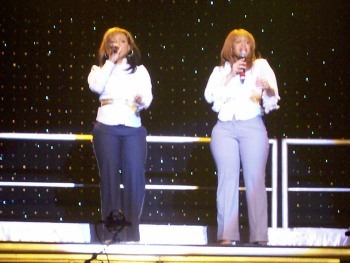 They continued with back-to-back powerful songs that sent the audience into a frenzy. 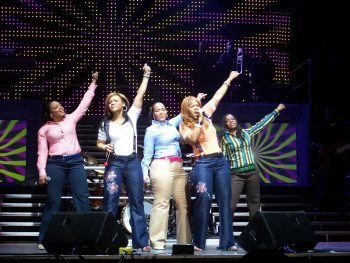 Their slow set included tracks such as “What is This?”, “Message In the Wind”, “and “I Can’t Give Up”, and they then closed with the chart-topping ’’Yesterday”, which turned the Coliseum from a Saturday night party to a Sunday morning praise session, complete with shouting and dancing. 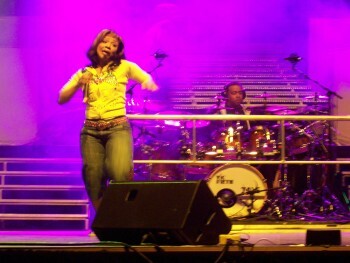 The praise party continued as the duo returned with more of their chart-busting hits, which included “The Real Party”, “Heaven”, and “Shackles”. The California duo did it big and proved why they are the hottest duo in the business. The band for the evening featured some of the industry’s finest musicians. With Joe Wilson and Shaun Martin on keyboards, Doc Powell on guitar, and SoundCheck’s George “Spanky” McCurdy on drums, along with a host of other keyboard players, a DJ, and a 3-man horn section, the night had no choice but to rock, and rock it did!! 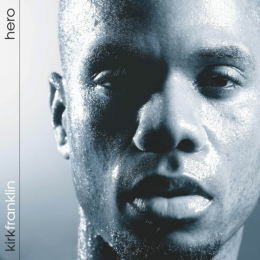 This led to the entrance of Kirk Franklin, who came out to another revolutionary video presentation, setting things up to go even deeper. 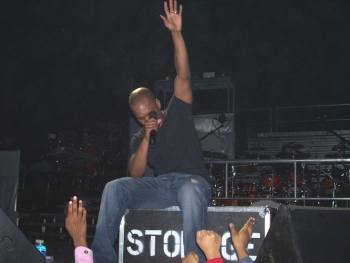 Backed by his vocal crew, he launched the party in a serious way, entering the arena through the crowd, and starting off with several of his finest works, with songs like “He Reigns” and new hits such as “Keep Your Head Up”. 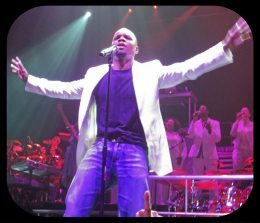 This stop on the tour was particularly special for Franklin’s team, in that one of his singers called the Hampton Roads area home. Tidewater native, Charmaine Swimpson, blessed the hometown crowd with an impromptu solo, at Franklin’s leading. After a major league praise party, Franklin went into a worship medley. Again, this was another opportunity to realize the sheer depth of Franklin’s musical catalogue, as he systematically performed snippets of hits from every album. Now how hot is THAT?! This included songs like “Silver & Gold”, “Why We Sing”, “Melodies From Heaven”, “Now Behold the Lamb”, and “My Life is In Your Hands”. These classics were fused with new hits like “Without You”, which created an amazing atmosphere for worship. This set was indeed powerful as Franklin traded the full band for a seat at the Rhodes keyboard, as his crew blessed the masses with these praise filled songs. 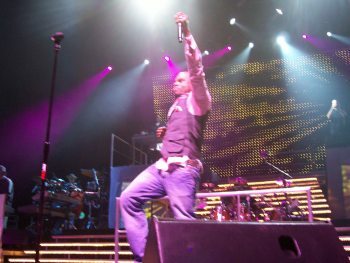 Franklin picked things up a notch and started the party once again with “Brighter Day” and “It Could’ve Been Me”, which caused the crowd to go nuts. 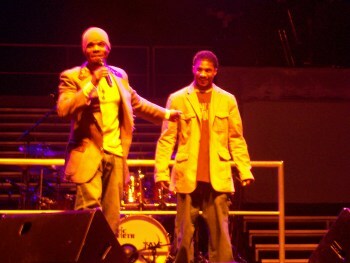 As Franklin beckoned the youth to rush the stage, the entire Coliseum partied hard, with Da T.R.U.T.H. and Mary Mary joining Franklin to make the party even hotter. Just as it was moving to a fever pitch, things transitioned to a very simple setting, as Franklin reappeared by himself with the introspective hit “Shout”, where he addressed the broken and hurt men in the audience. That was followed by “Imagine Me”, which again blessed the masses. Franklin then ministered to the people, inviting many to Christ and to experience wholeness. On each stop of the tour, Franklin and company recognize and honor a hometown hero. The hometown hero at this stop was Pastor Ernest Martin, a father, pastor, and community leader. The party closed things out with “Stomp” and the finale, “Hosanna”. Without question, the Hero tour is a must-see event. It’s hard to recall when artistry, production, and ministry has ever gelled so perfectly as during this tour. If the Hero Tour is raging through a city near you, brace yourself for Gospel music being presented in its most excellent package to date.